During this Monsoon Season, what could be better with the evening tea than this Crispy Moong Dal Pakoda? 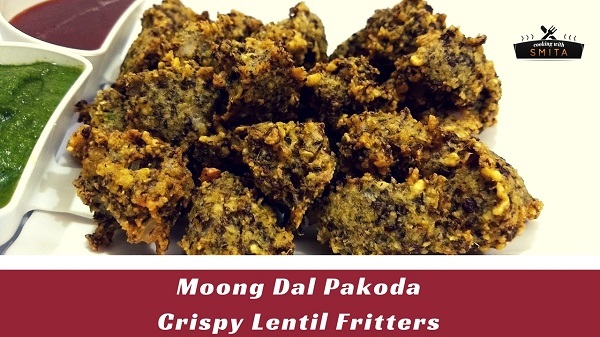 Call it Moong Dal Bhajiya or Lentil Fritters – it is a perfect Tea-Time Snack food made from Split Green Gram. Try this one of the most popular street food of North India at home; it is also a favourite Gujarati Snack Food. Soak Moong Dal/Split Green Gram in water for 2 hours, drain the water. Add soaked Moong Dal, Green Chillies and Ginger in a mixer jar and coarsely grind together. Do NOT make a fine paste (check the video below) and do NOT add water while grinding. Add the mixture in a large bowl, add chopped Onions & Salt, mix well. Heat Oil for deep frying in a wok over medium flame. Drop spoonful of the mixture in hot oil using your fingers. Deep fry until they turn crispy & golden brown from all the sides. 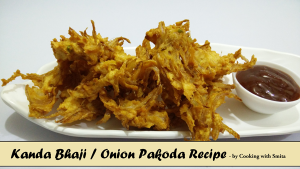 Repeat the process to make more Pakodas. Serve immediately with Chutney or serve as Tea-time snack.